For many parents in the Mission Viejo, Las Sorres, and San Juan Capistrano area, this may come as a surprise. Today in the Hales Parker Dentistry post, we are going to review 4 reasons why your toddler’s teeth are worth a dental visit. 2. One of the most important things your Las Sorres or San Juan Capistrano dentist will do at this visit will be to clean those young teeth and apply fluoride. 4. Visiting the dentist also helps parents enlist the help of other adults is establishing good dental habits in their children. 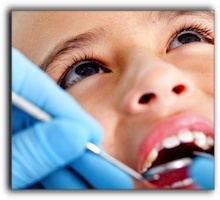 Starting early dental visits will mean that later in life your child is less likely to require braces or other cosmetic dentistry procedures such as dental implants. I’m Dr. Lincoln Parker, of Ladera Ranch. I want my patients to have the best oral health possible. I also want them to look their best, so if you have any questions about a smile makeover or other cosmetic dentistry procedures, contact my friendly dental team at 949-429-0049. Eating Got You Down, Ladera Ranch?